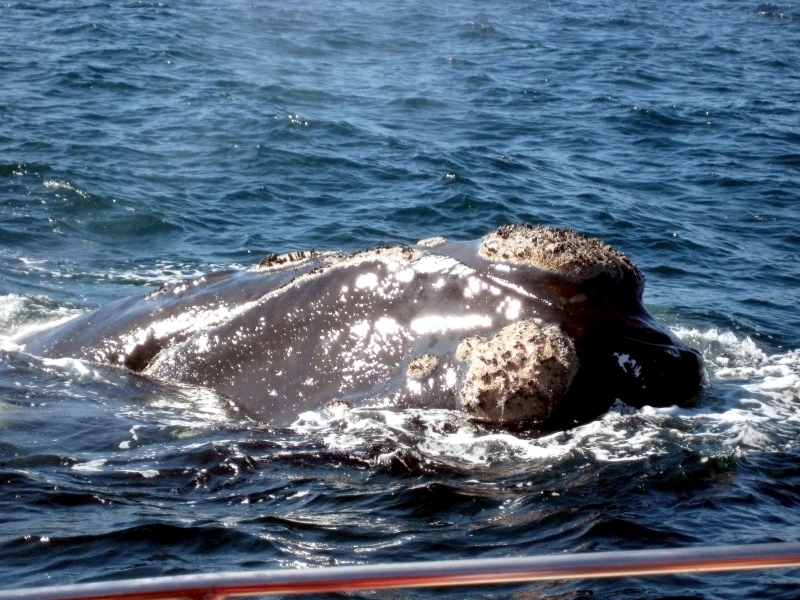 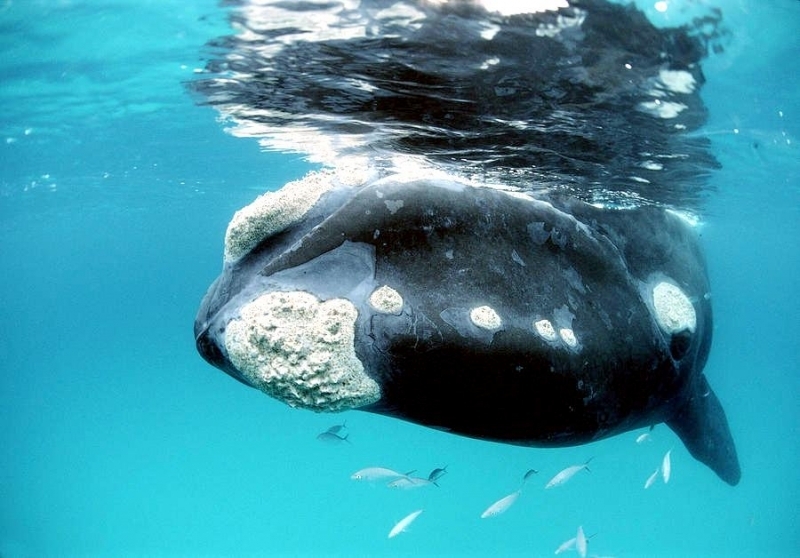 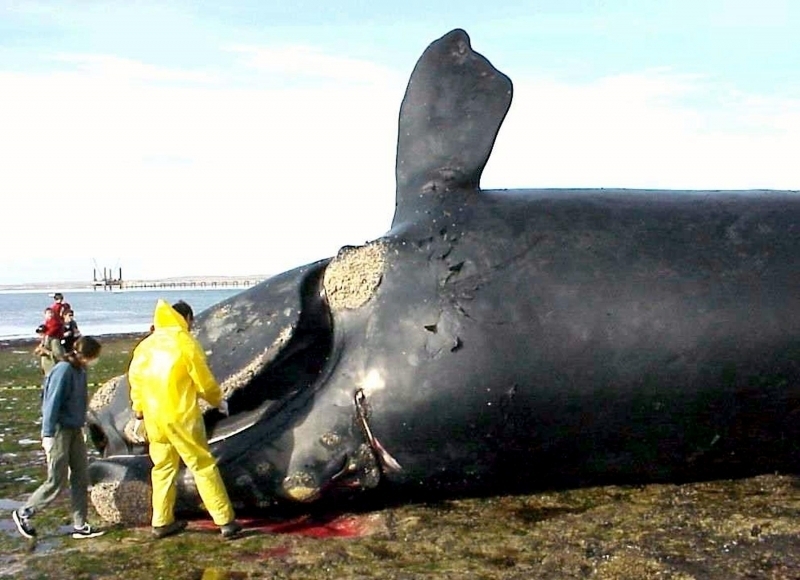 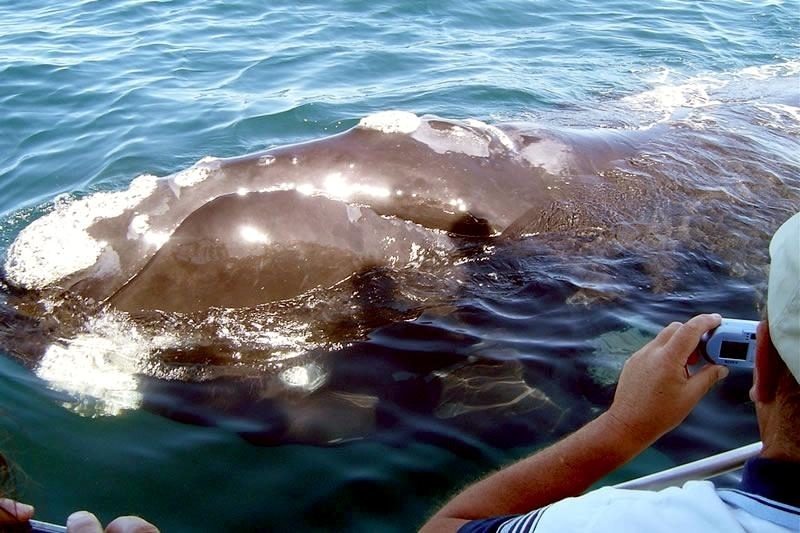 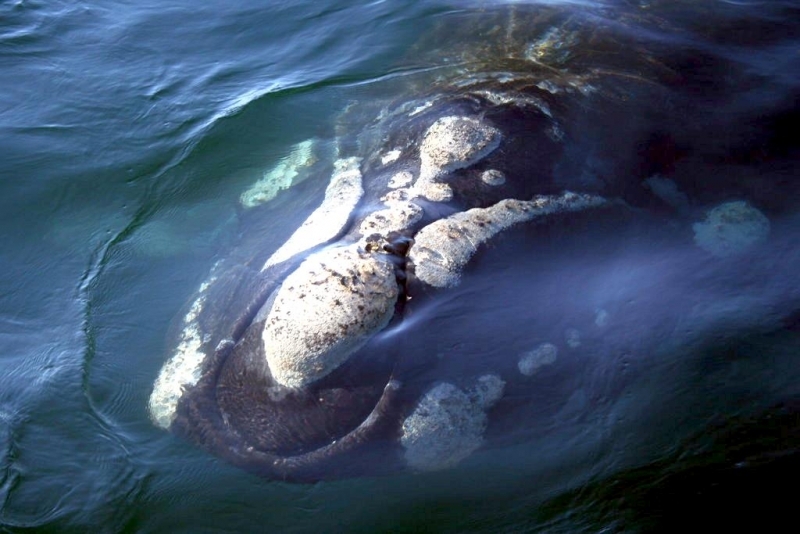 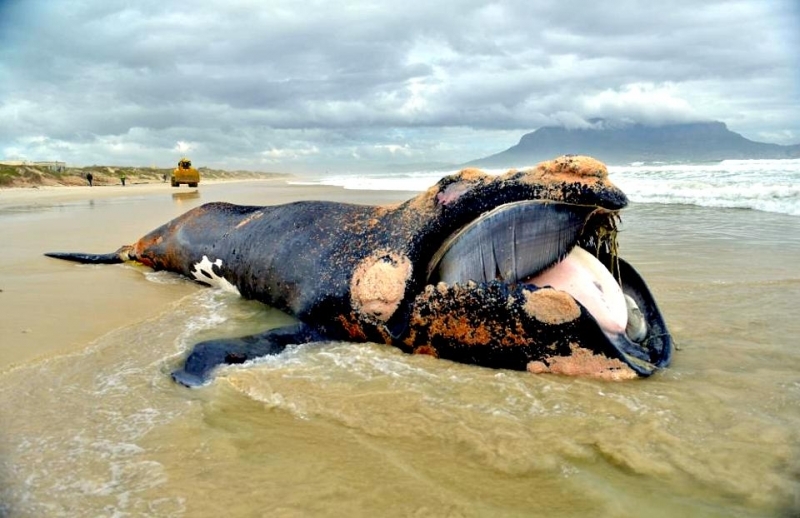 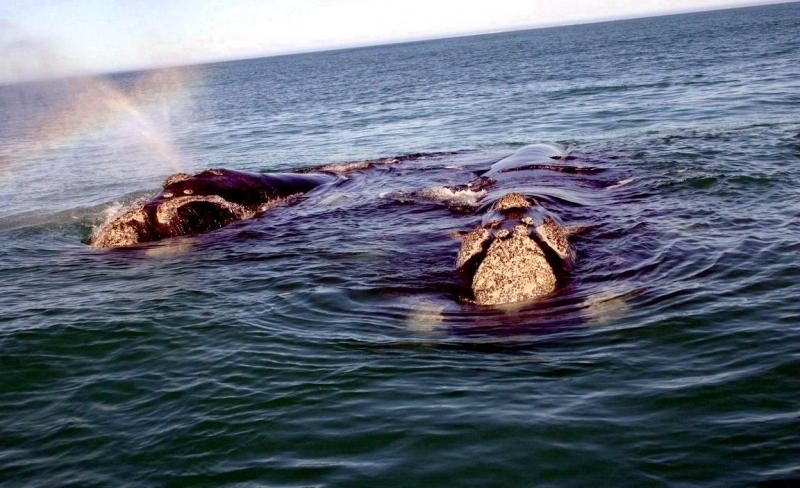 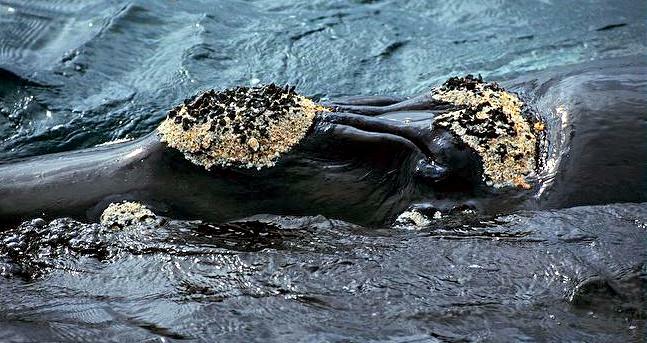 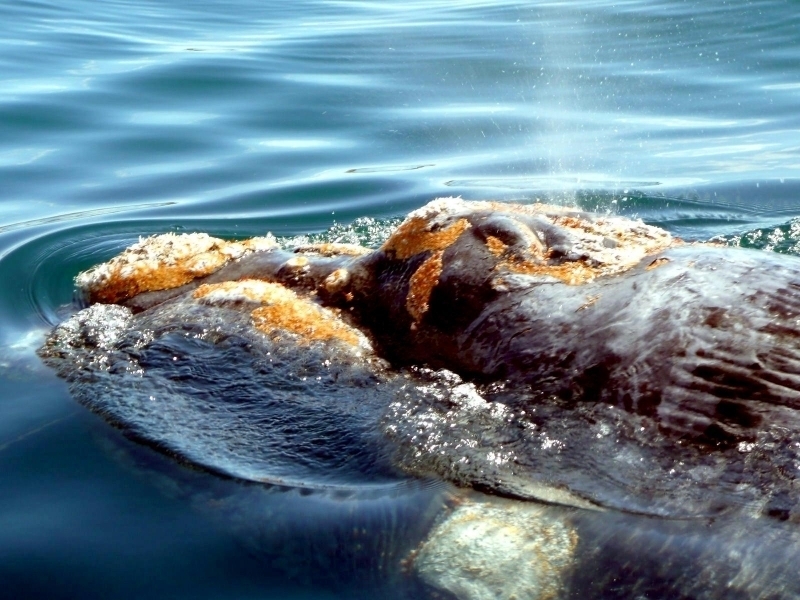 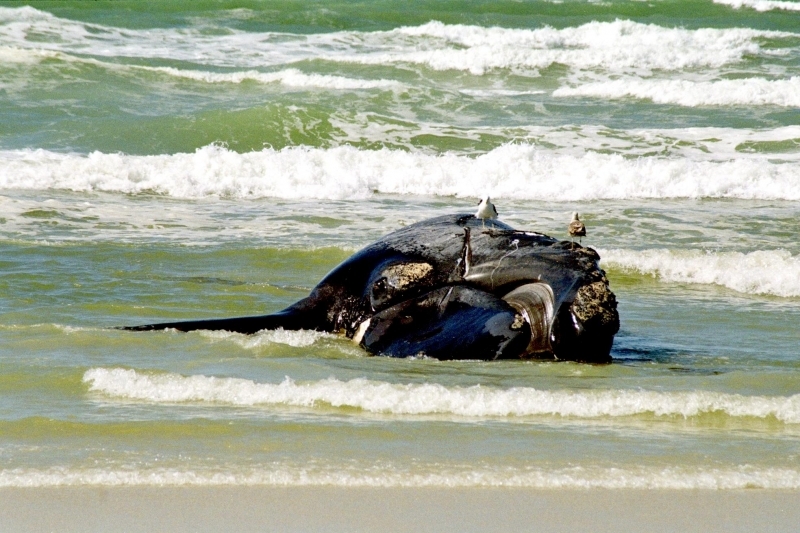 Southern Right Whales are known by their uniformly dark color and white callosities found on the head. 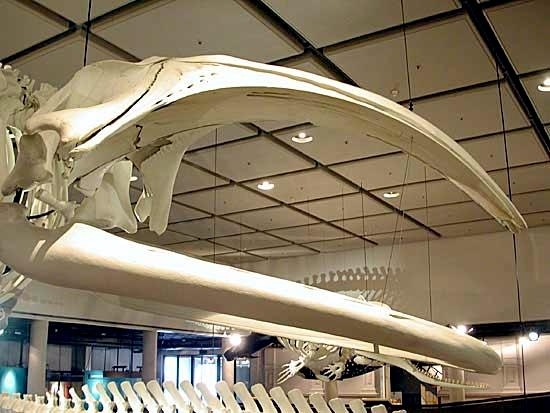 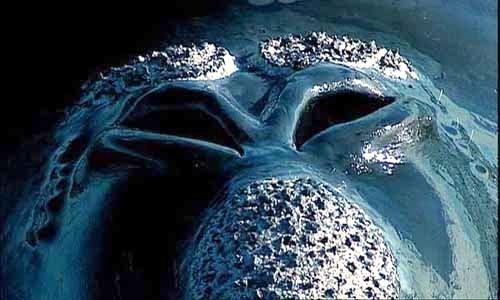 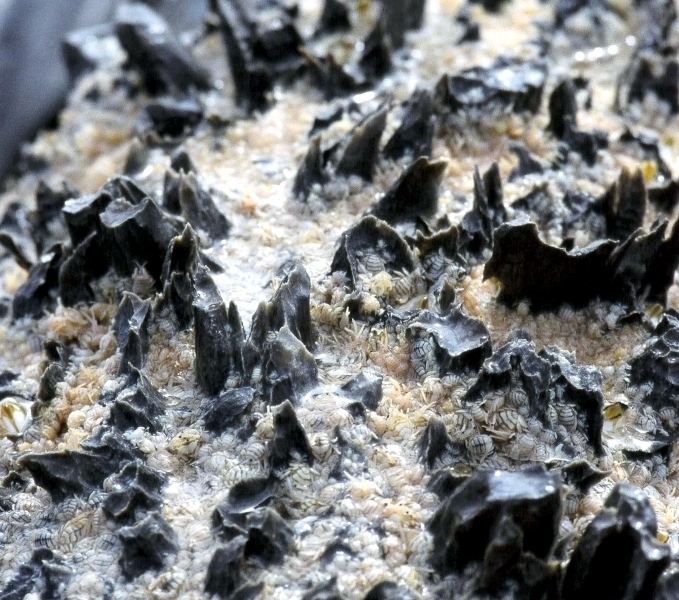 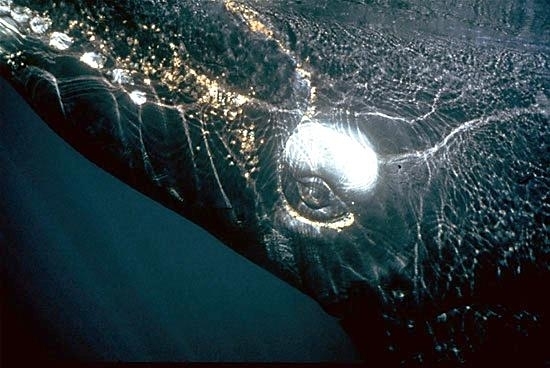 Callosities which are outgrowths of tough skin are used in identifying individual whales as they are unique to each animal, similar to fingerprints in humans. 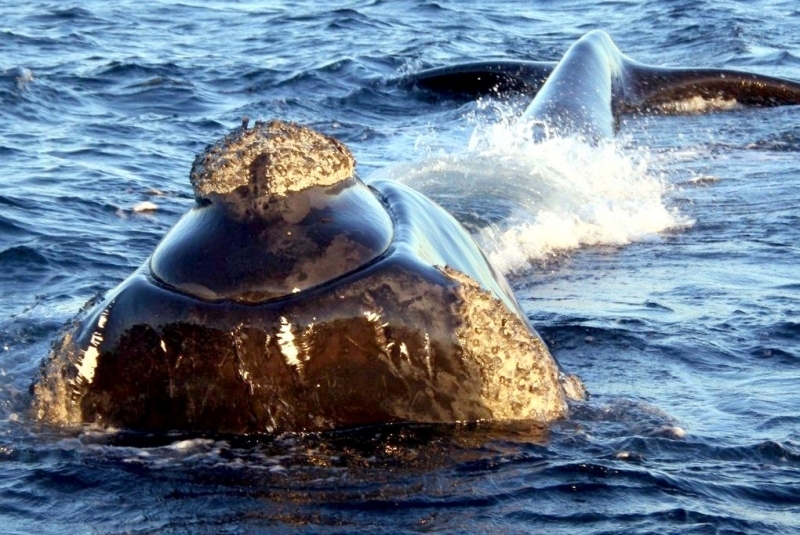 The largest of these excrescences is located on the anterior-most portion of the head and is referred to as the “bonnet”. 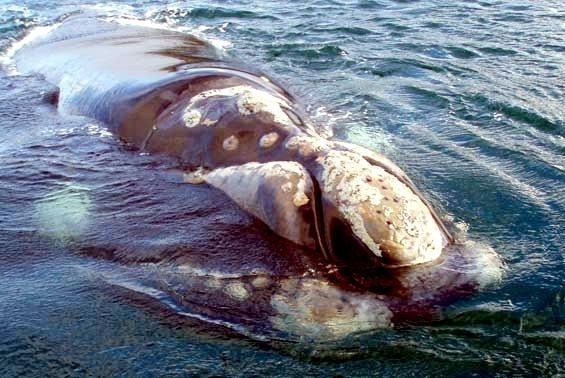 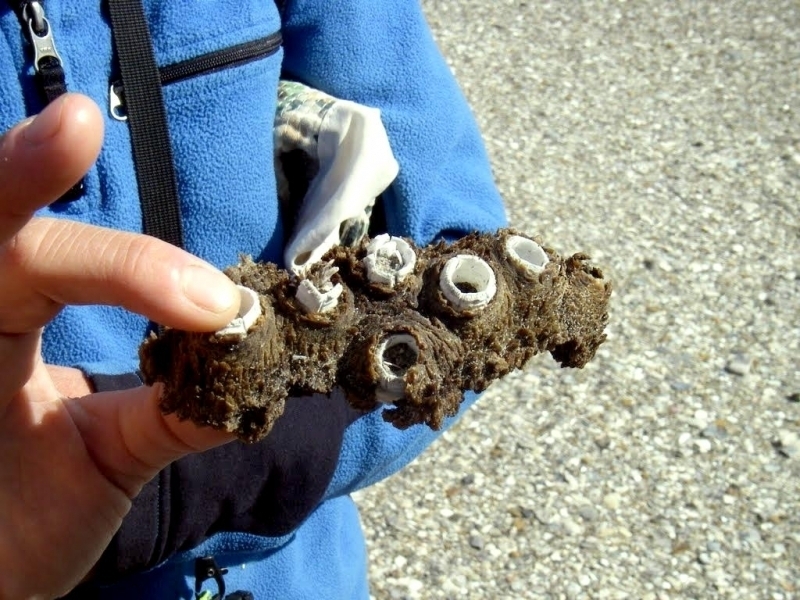 Other excrescences are on the upper edge of the lower jaw, behind the blowhole and above the eye. 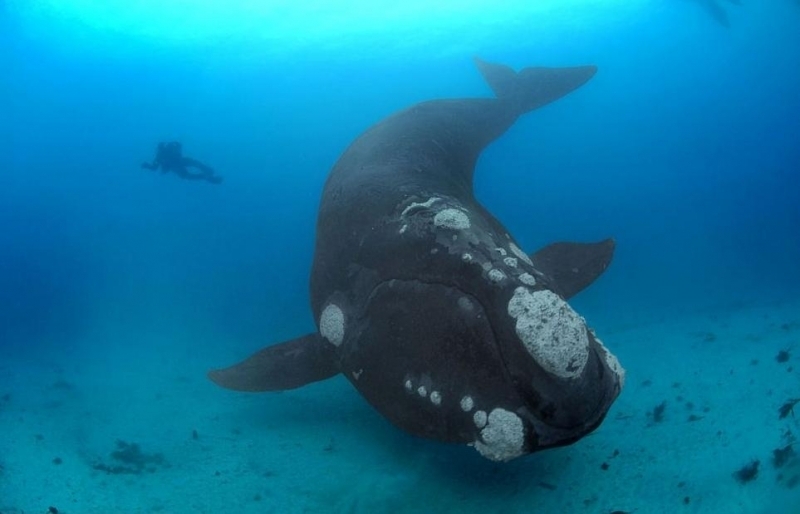 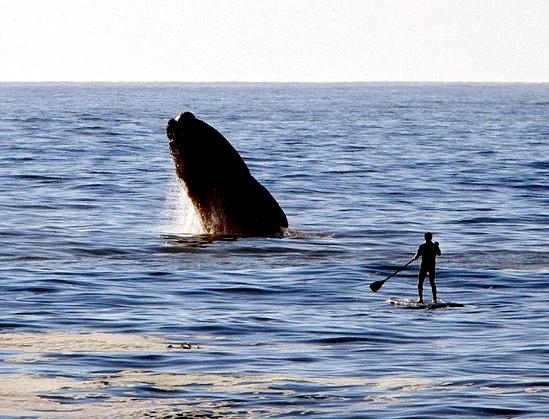 The Southern Right Whale is on average between 16-18 meters long at maturity, males being slightly shorter than females. 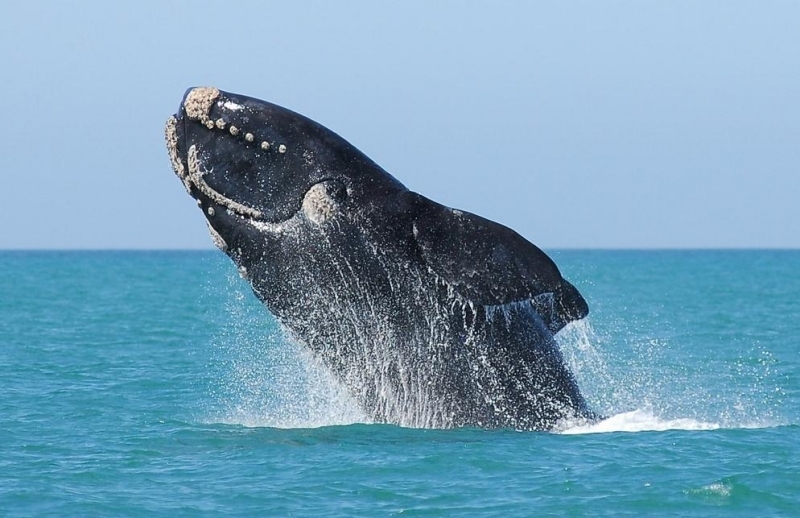 It has a rotund appearance, a very large girth relative to the length with an enormous head approximately 1/3 the body length. 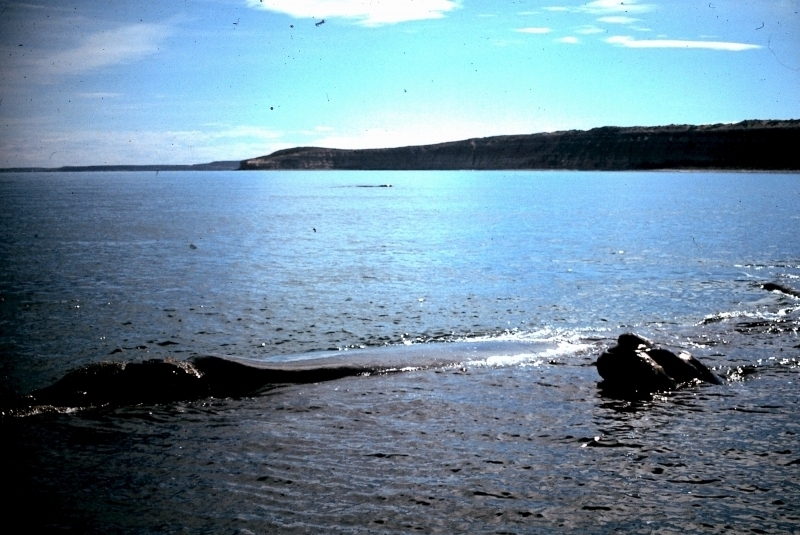 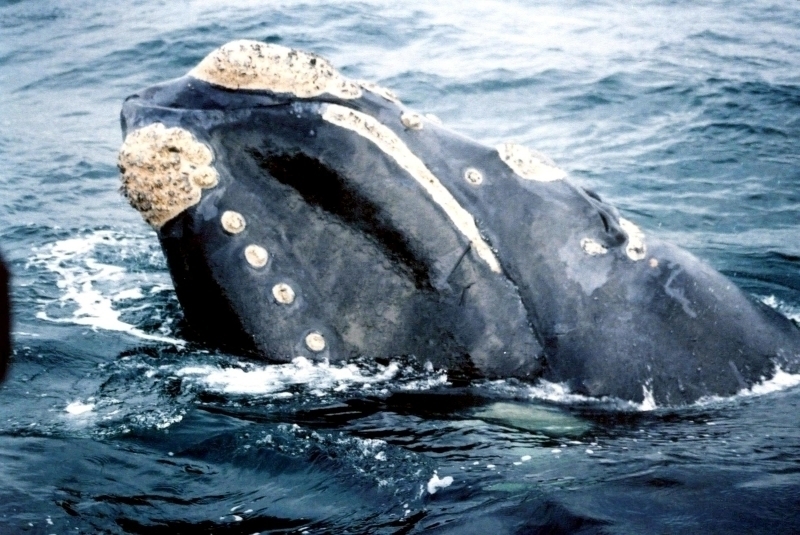 Southern Right Whales do not have any dorsal fins, nor do they have the grooved throat that is typical of the balaenopterids. 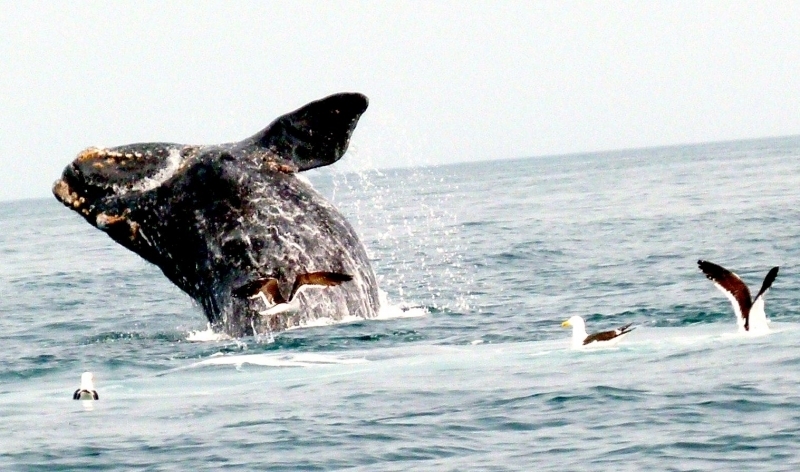 The flippers are also broad and relatively short. 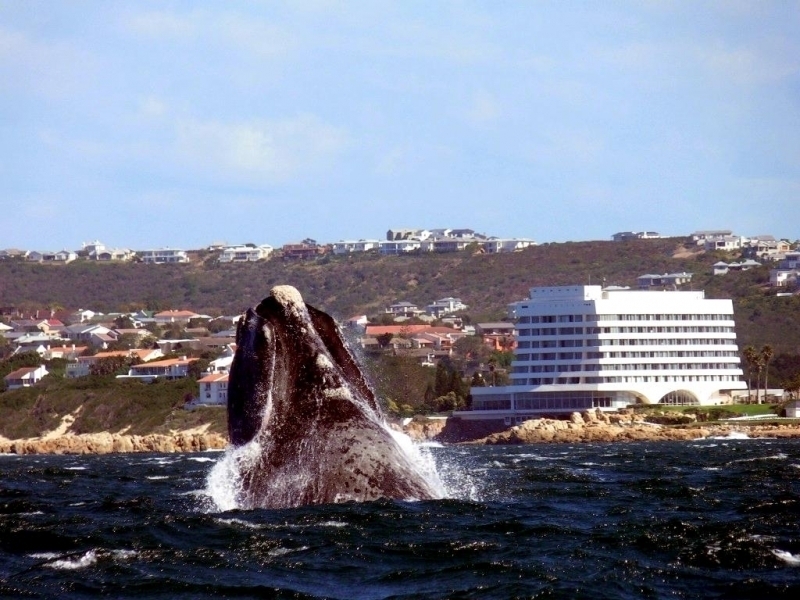 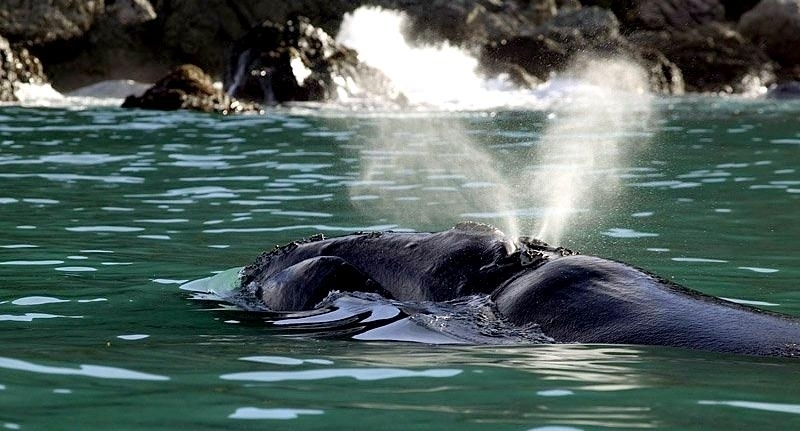 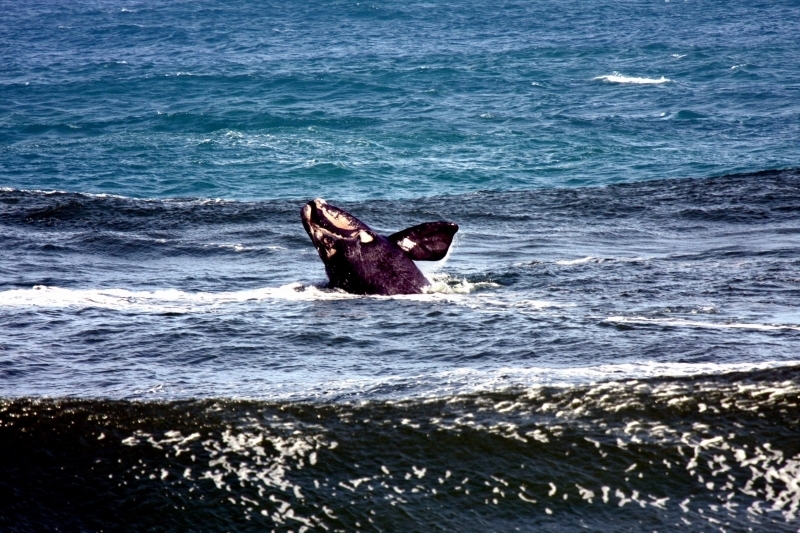 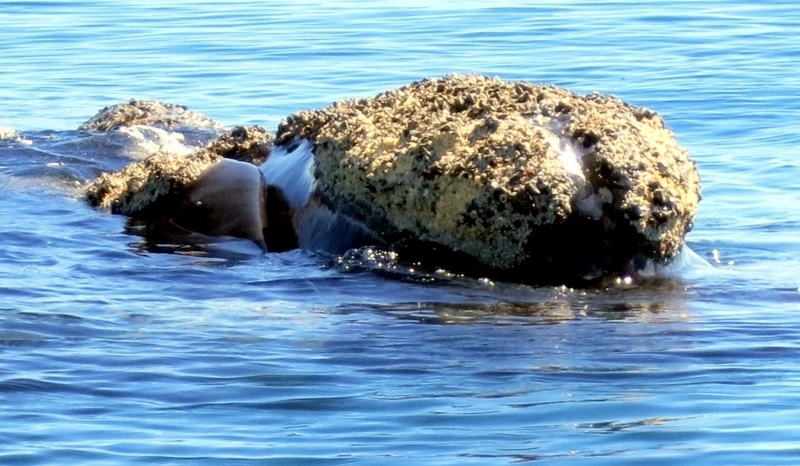 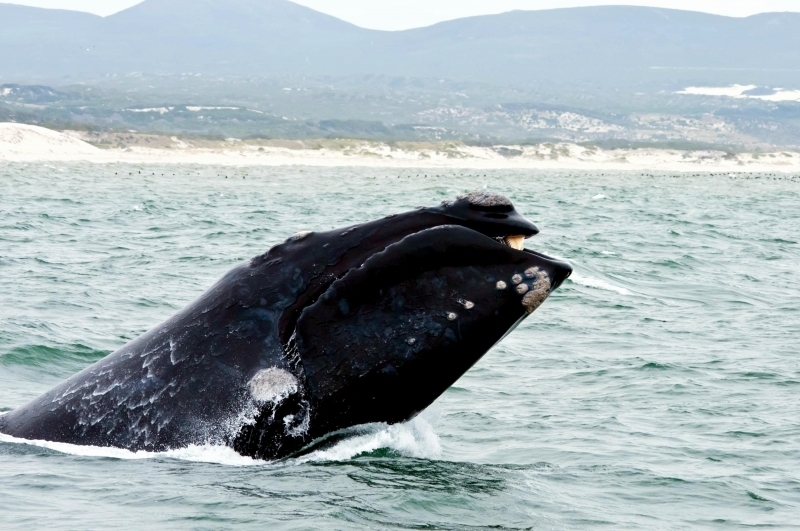 Another distinguishing physical feature of Southern Right Whales is the blowhole. 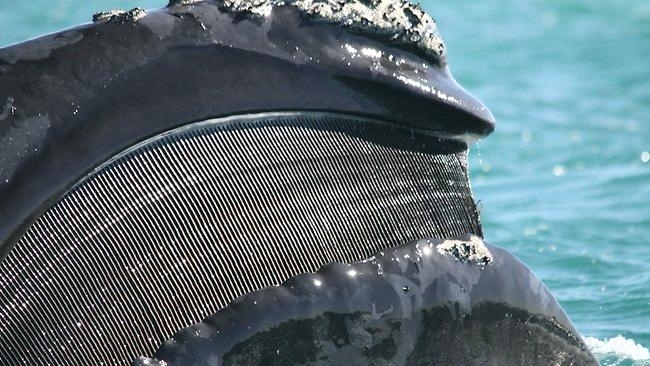 The exterior of the blow-hole is well-partitioned, resulting in a V-shaped exhaust of condensation. 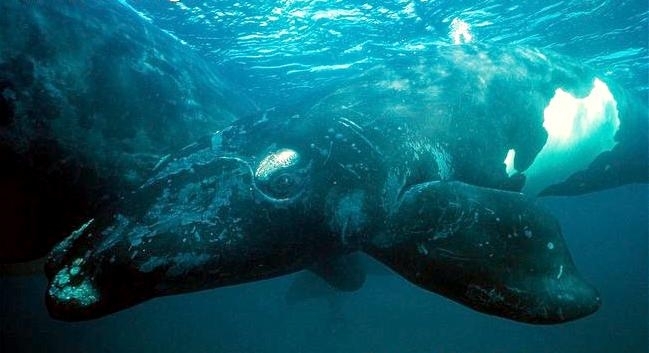 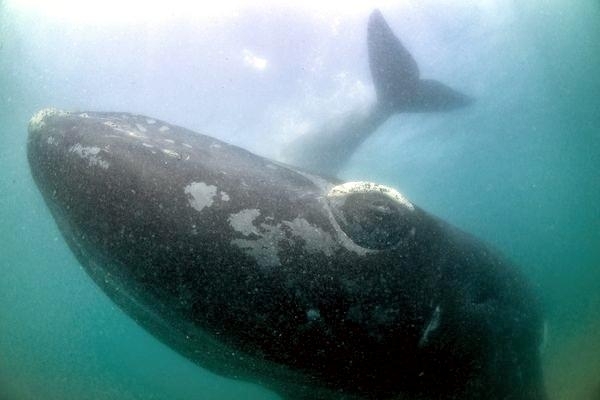 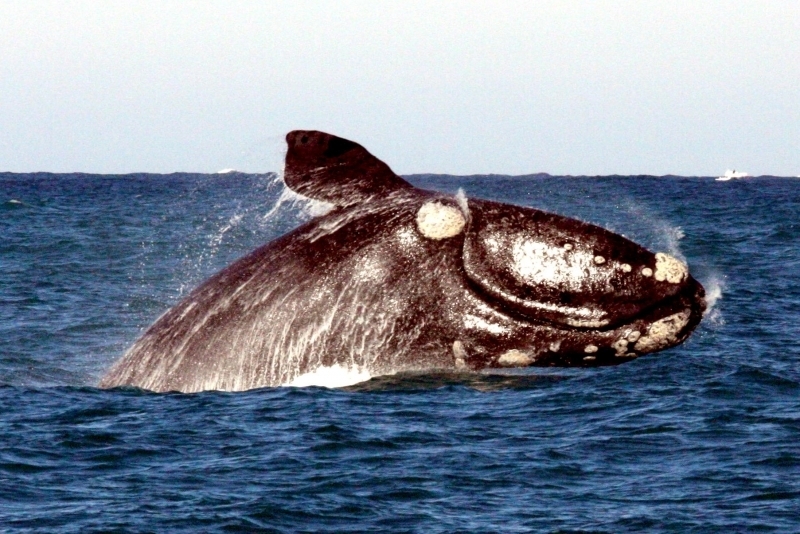 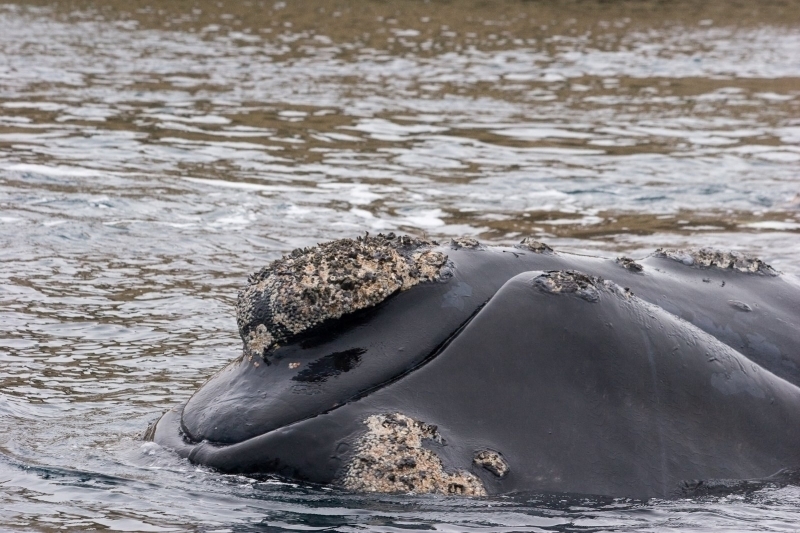 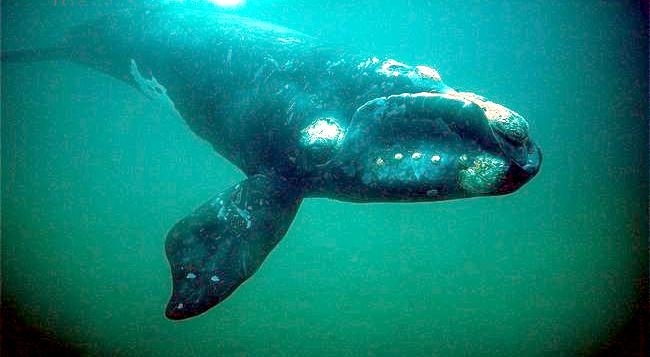 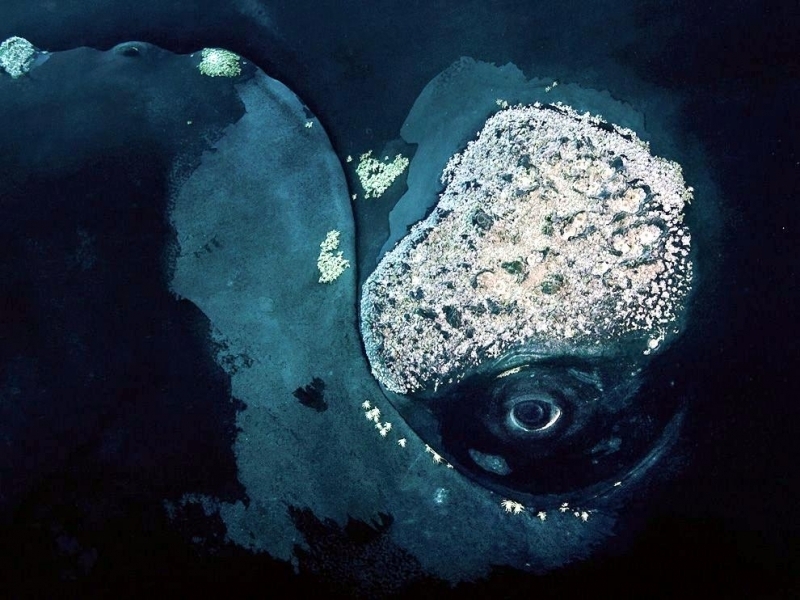 Southern Right Whales have a well-developed dermis without fat, whereas most balaenopterids lack a dermis. 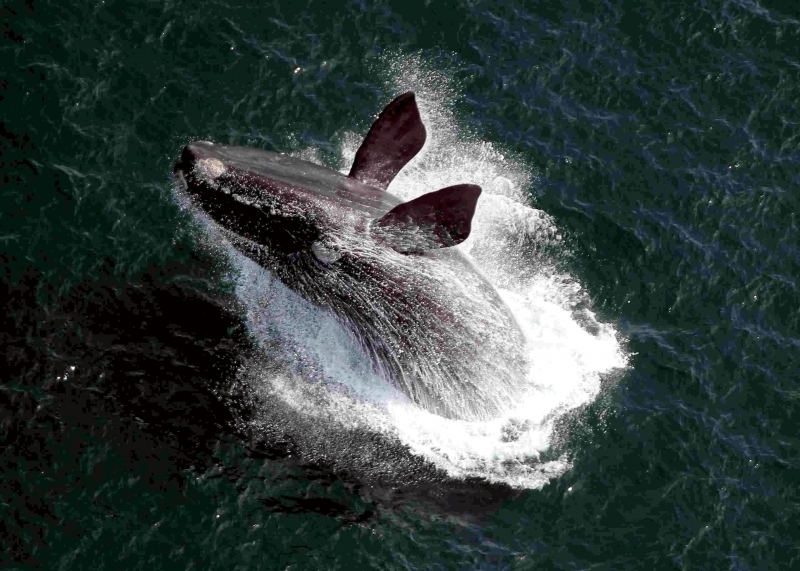 Adult Southern Rights weigh 36,000-73,000 kilograms. 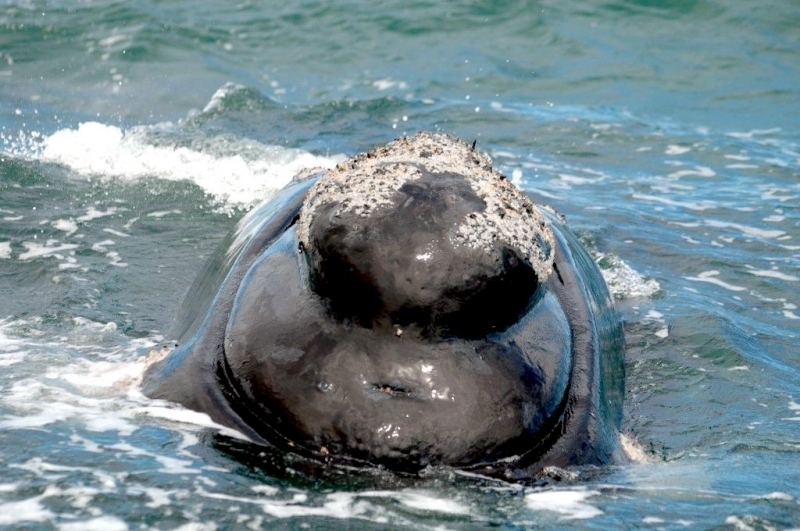 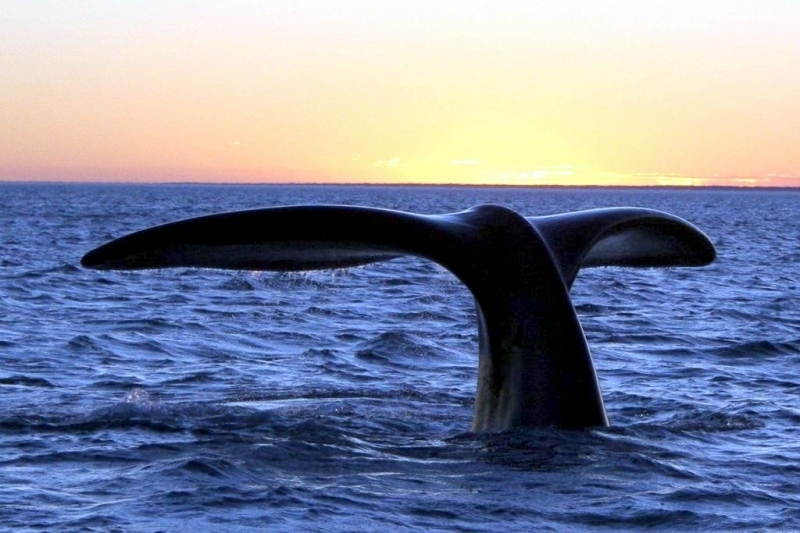 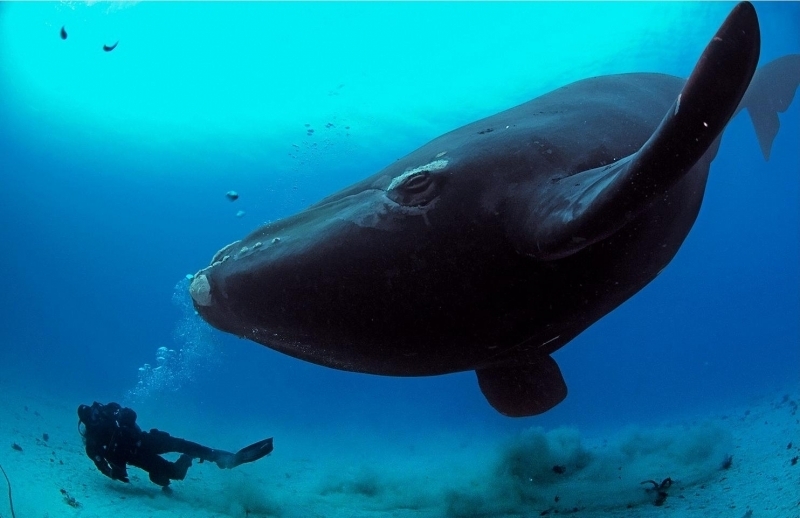 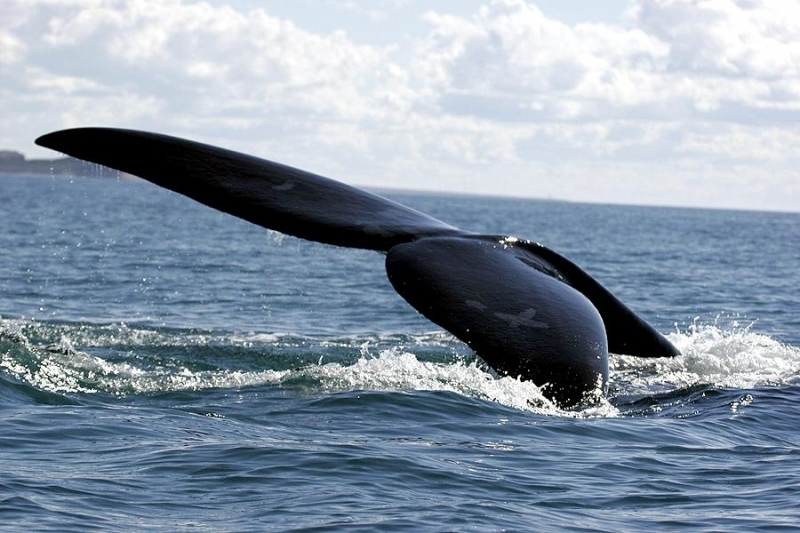 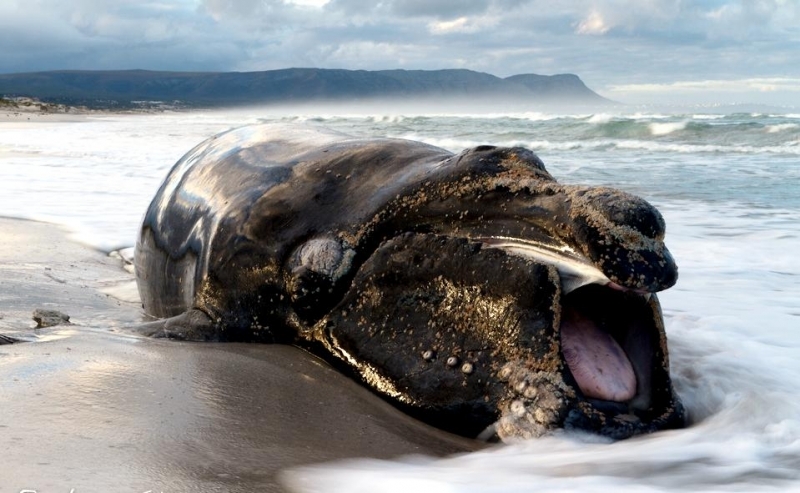 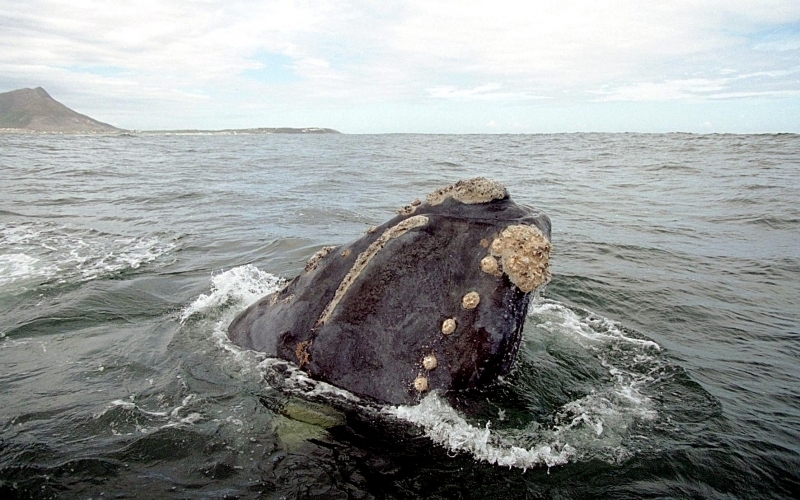 Southern Right Whales produce short, low-frequency moans and pulses. 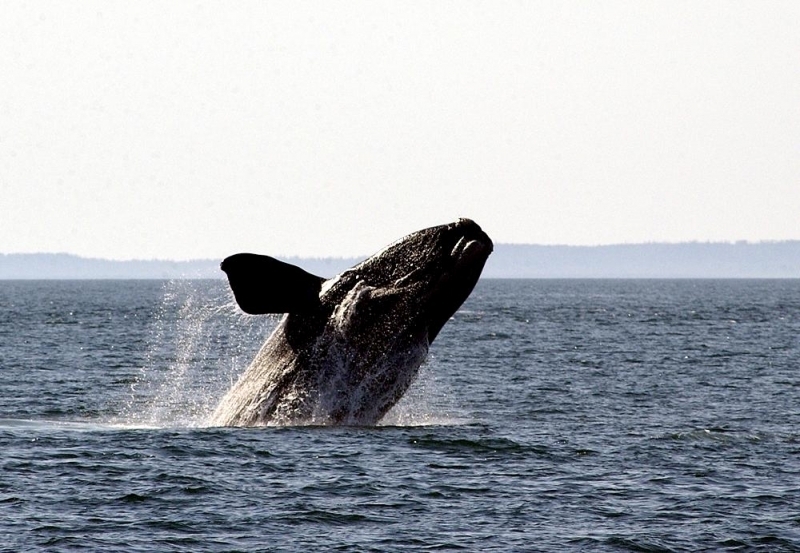 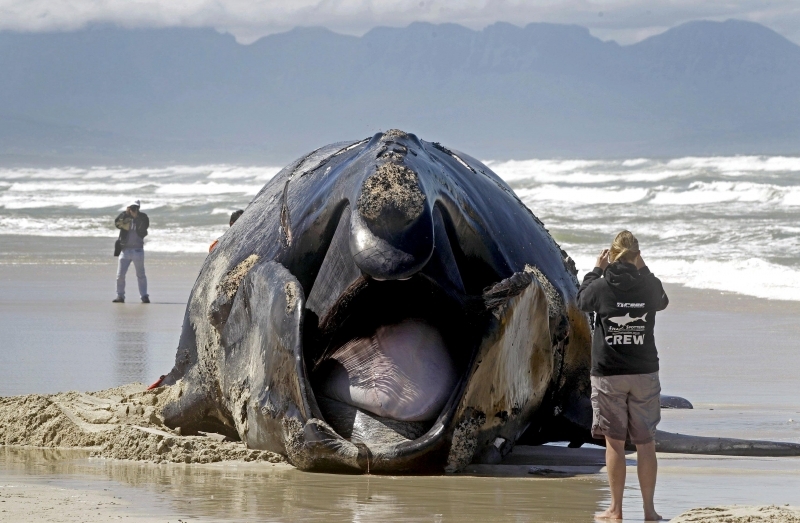 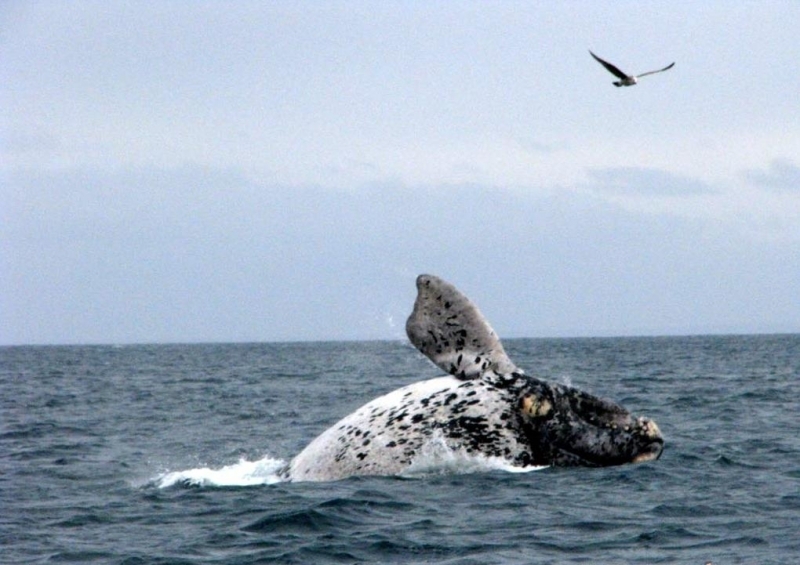 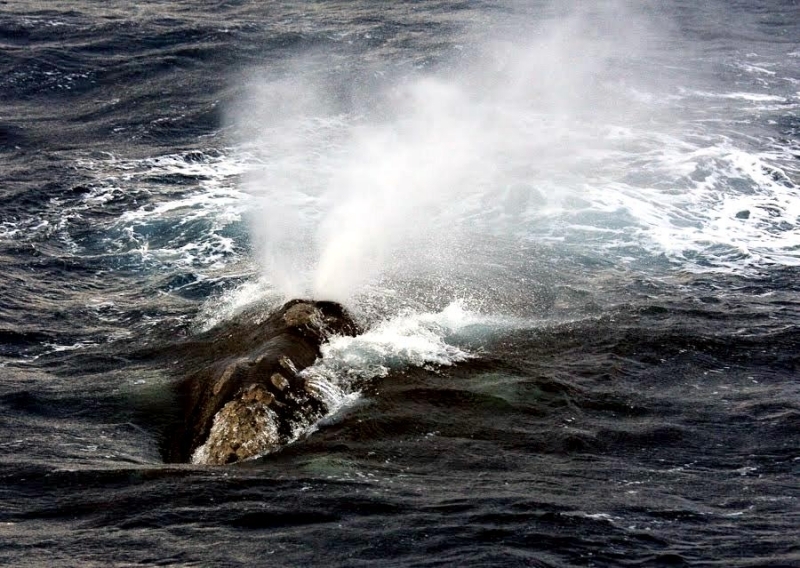 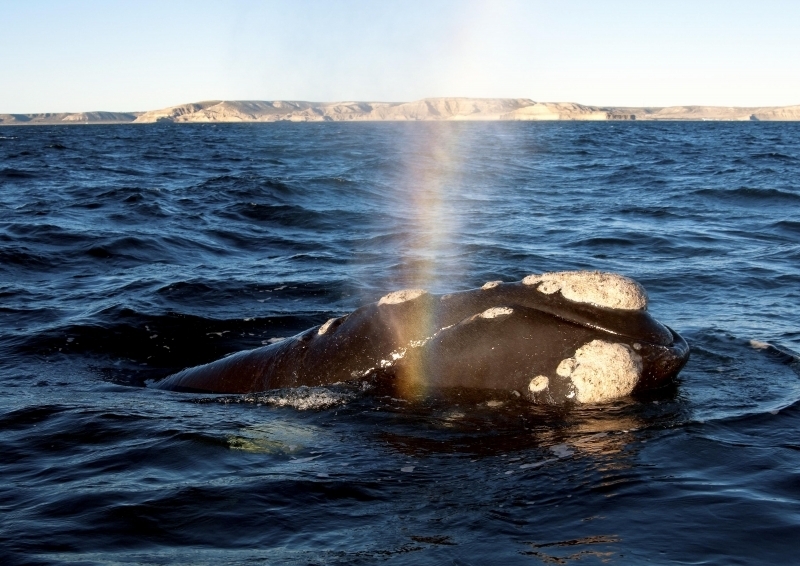 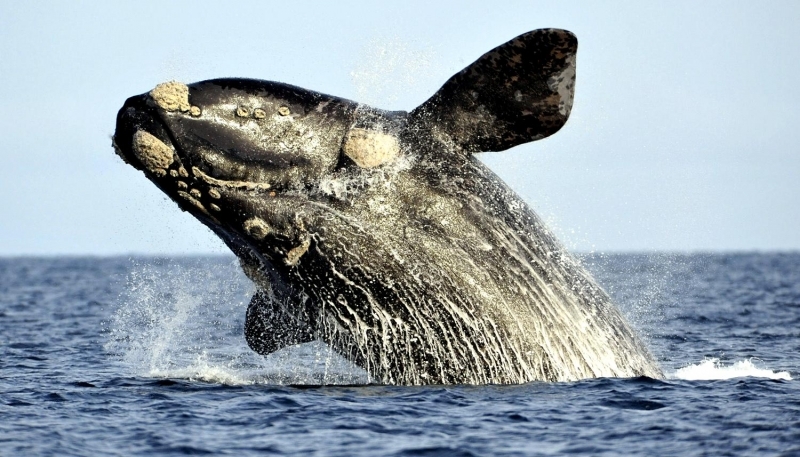 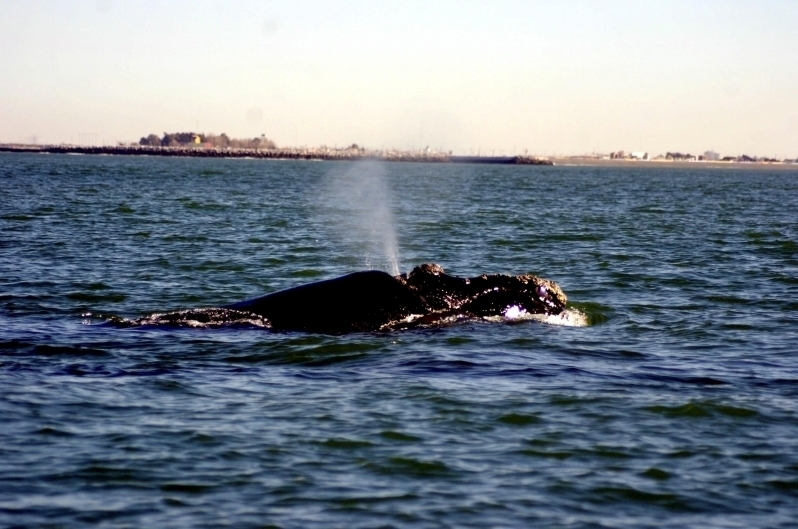 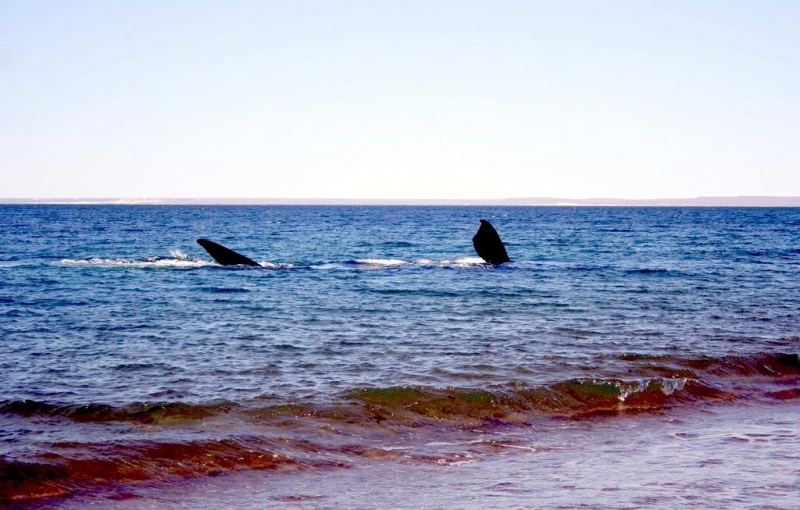 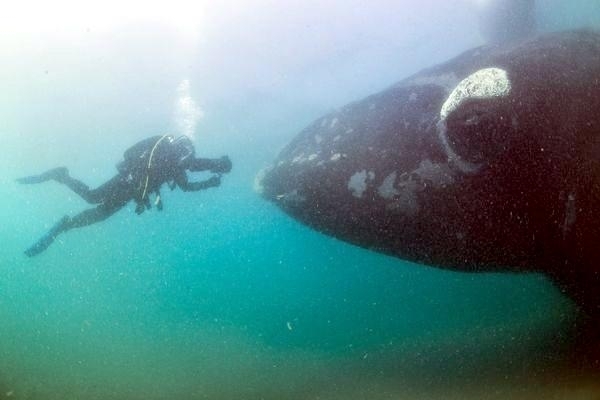 Also heard often below and above the water’s surface, are the blows of the Southern Right Whales. 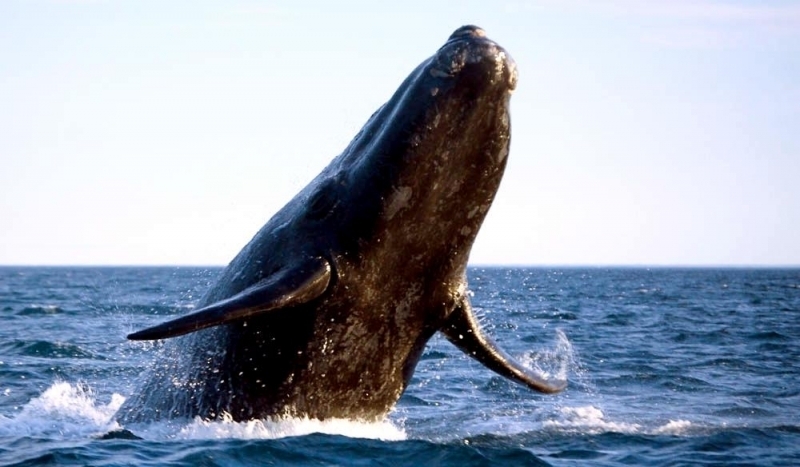 However, the most common sound produced is a belch-like utterance that averages 1.4 seconds long at a frequency of less than 500 mhz. 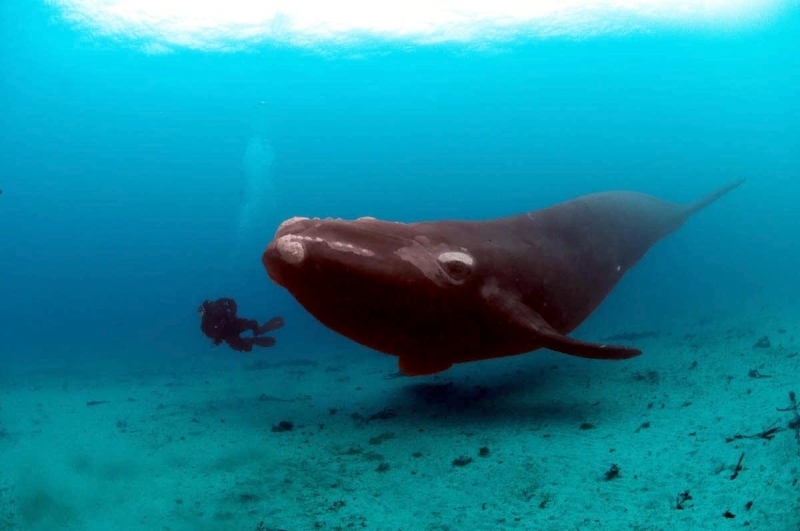 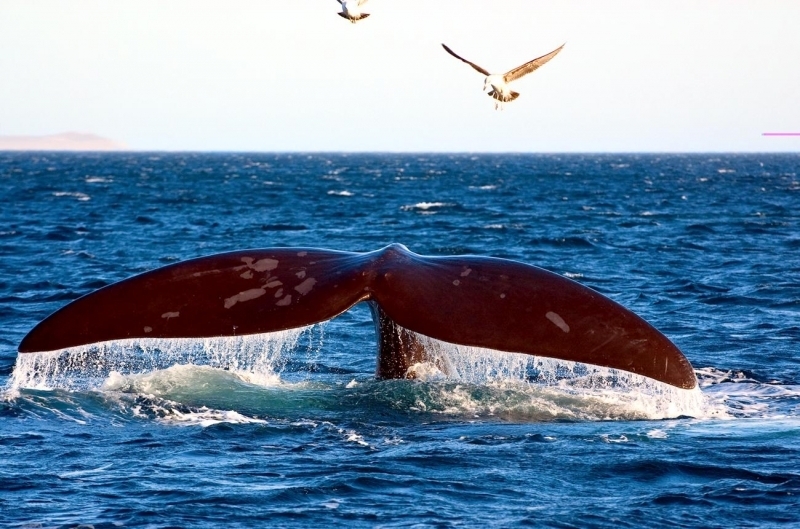 These whales also produce simple moans in a narrow range of frequencies and complex moans that shift frequencies and overtones. 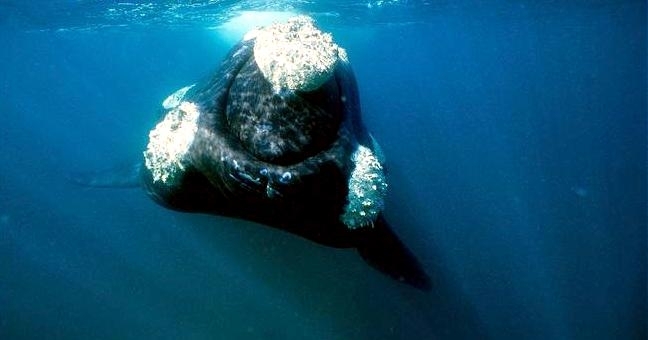 Other sounds created by Southern Right Whales are those caused by the slapping of theirs fins & tails, while rolling over at the surface of the water—usually occurring during mating courtship. 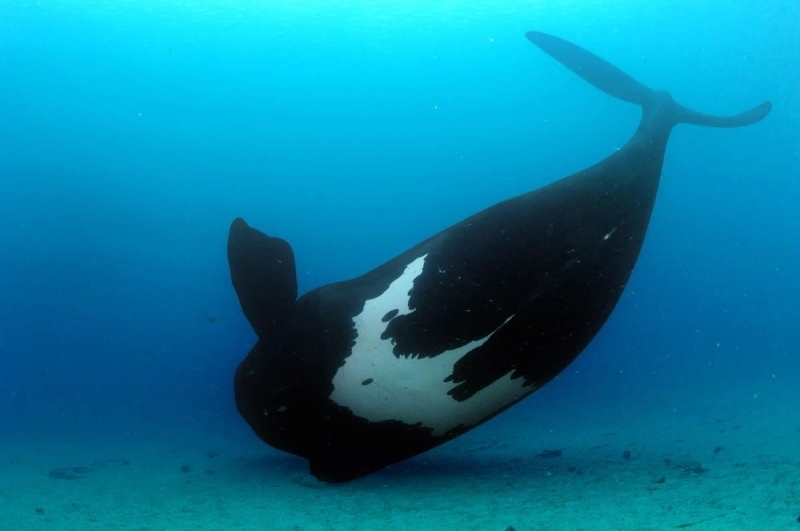 In a common behavior among these whales called “head-standing”, they assume a vertical position and extend the flukes into the air often rocking back & forth for as long as 2 minutes at a time. 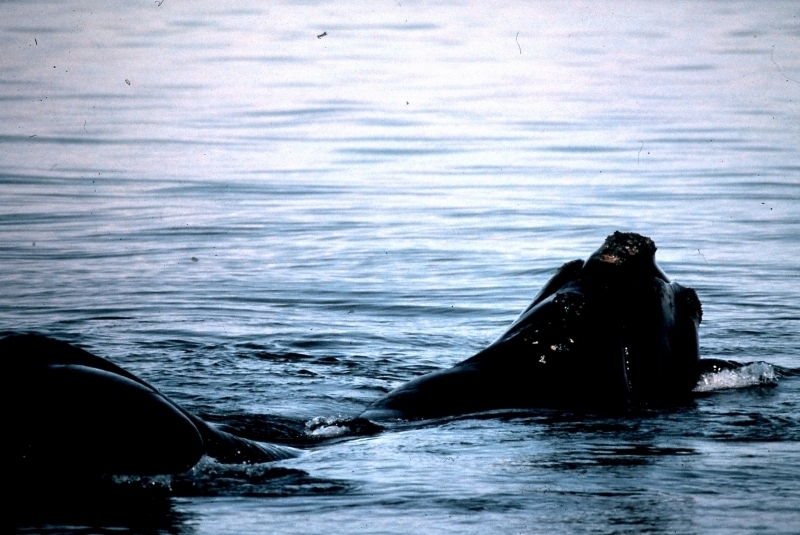 Research initially indicated that this position was used for feeding on benthic organisms, however is more recently believed to be either a resting position or a courtship stimulus. 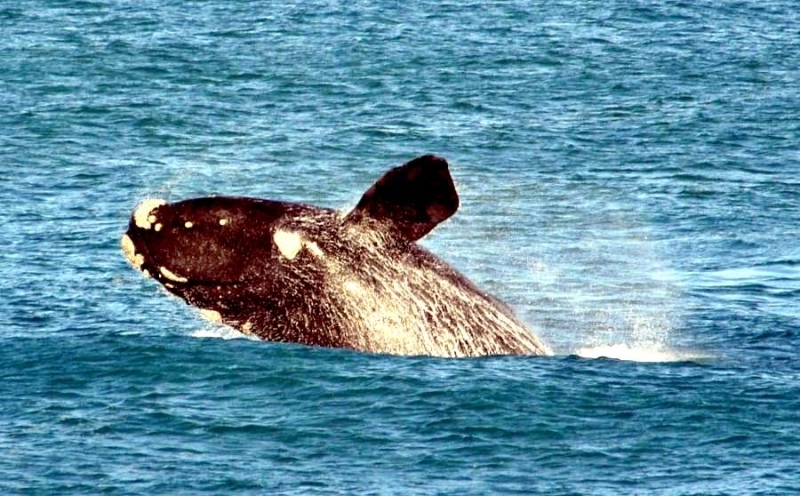 Southern Right Whales are also commonly seen breaching—turning in midair and falling into the water with the side or back of the body. 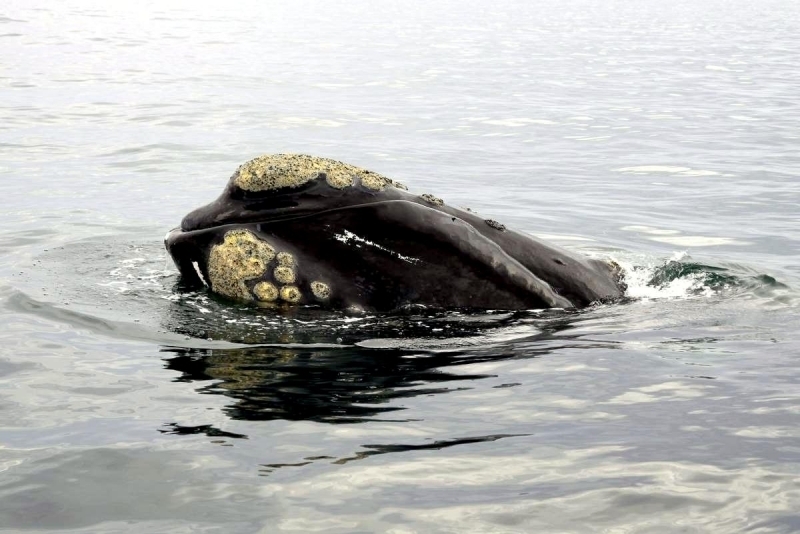 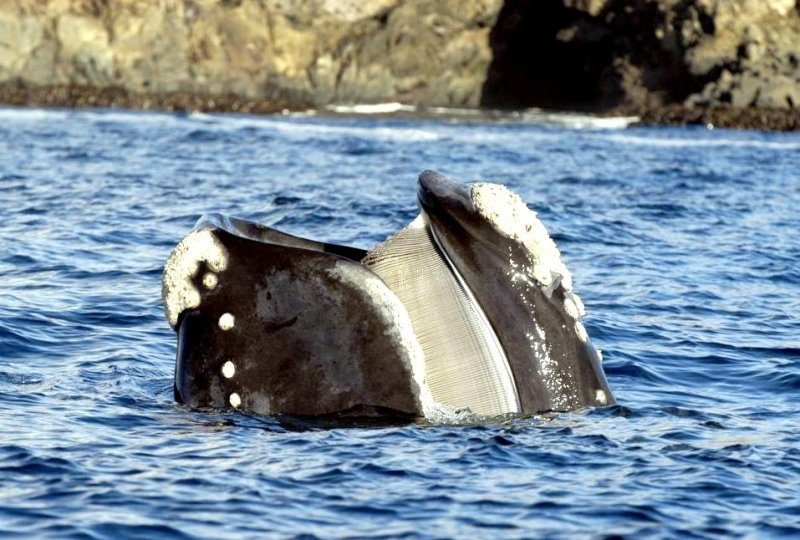 This behavior may dislodge parasites from the whale’s surface, but is also a display mechanism during mating. 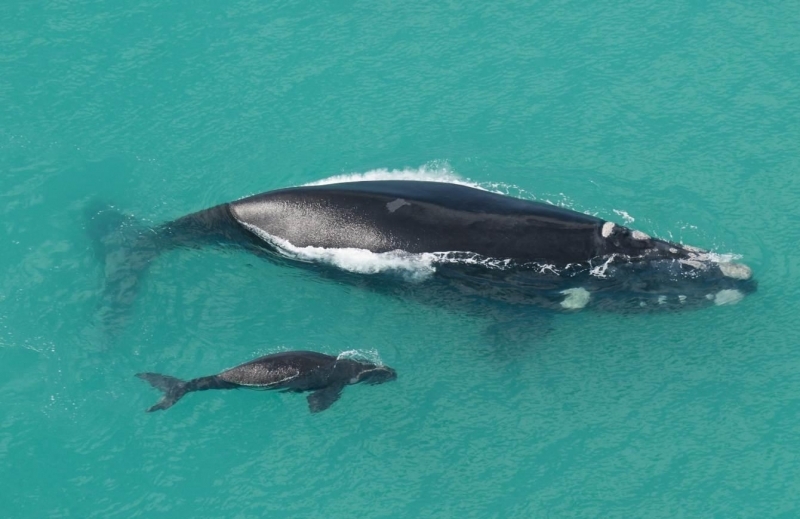 Found only in the southern hemisphere, Southern Right Whales have a circumpolar distribution between 30-50°S, inhabiting sub-Antarctic waters. 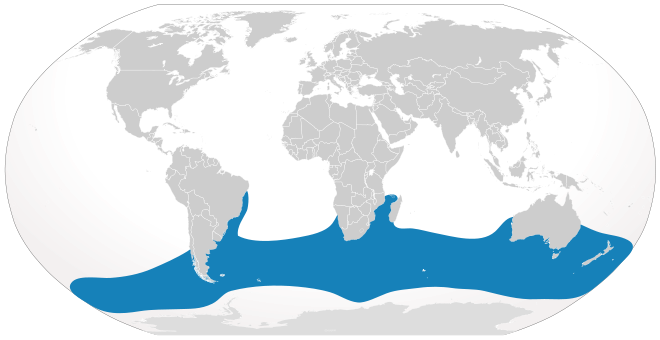 While avoiding warm equatorial regions, they remain near continents and island masses. 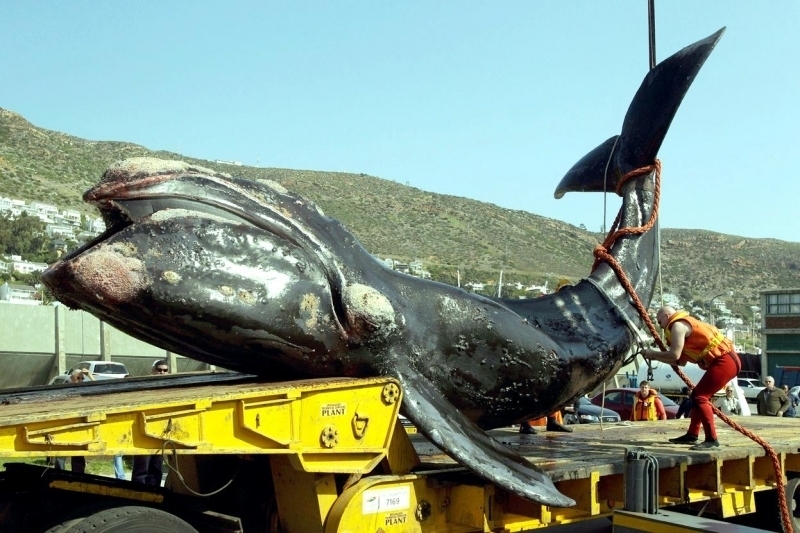 Using their long and numerous baleen plates, Southern Right Whales feed on small plankton, including pelagic larval crustaceans and copepods. 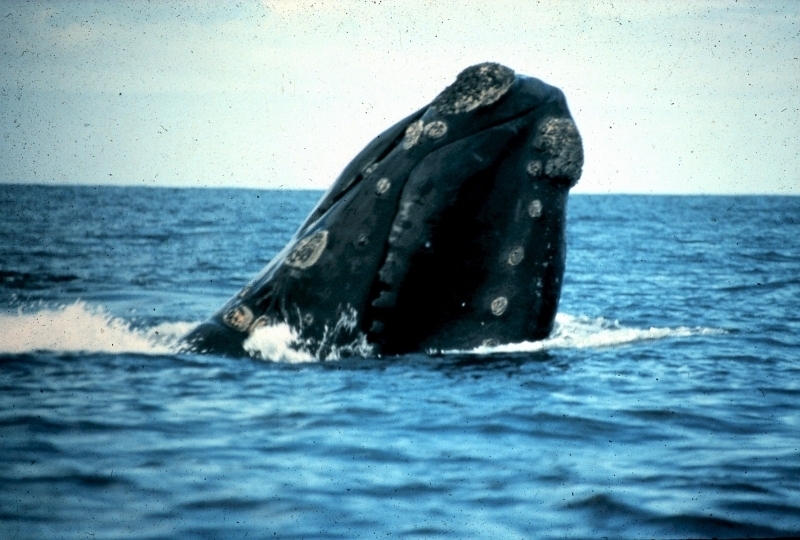 They are most often observed using 1 of 2 feeding techniques. 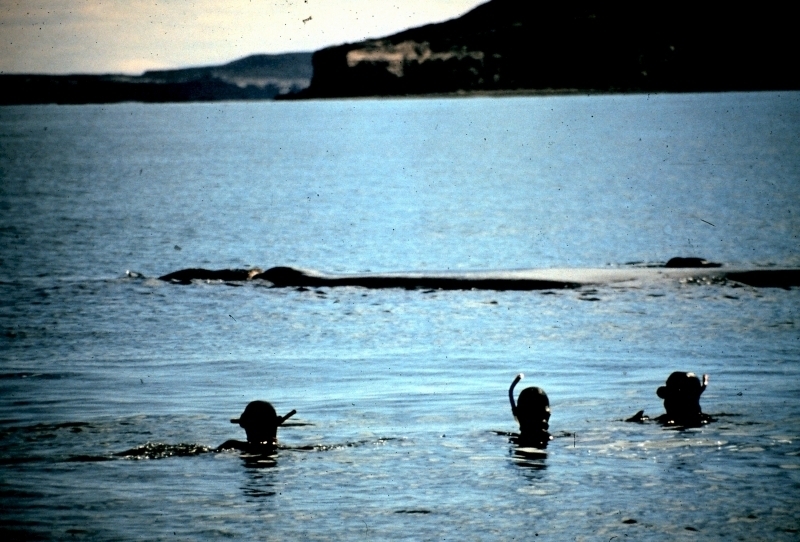 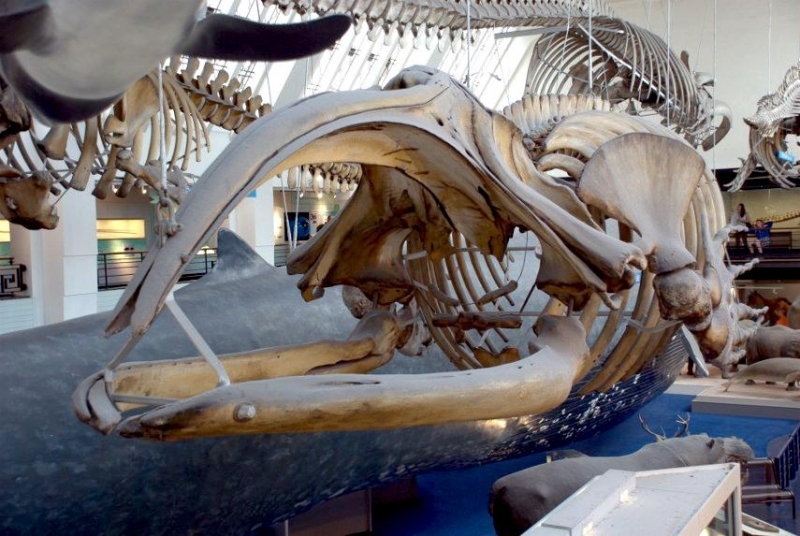 The first surface feeding, occurs when the whales selectively swim through densely populated plankton slicks with their mouths wide open and baleen exposed. 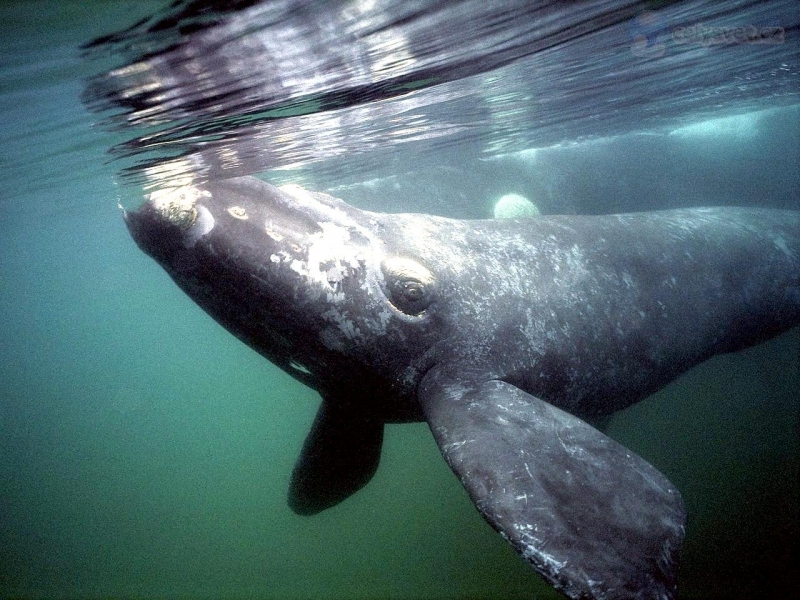 The other method occurs while submerged, presumably in highly dense populations of plankton. 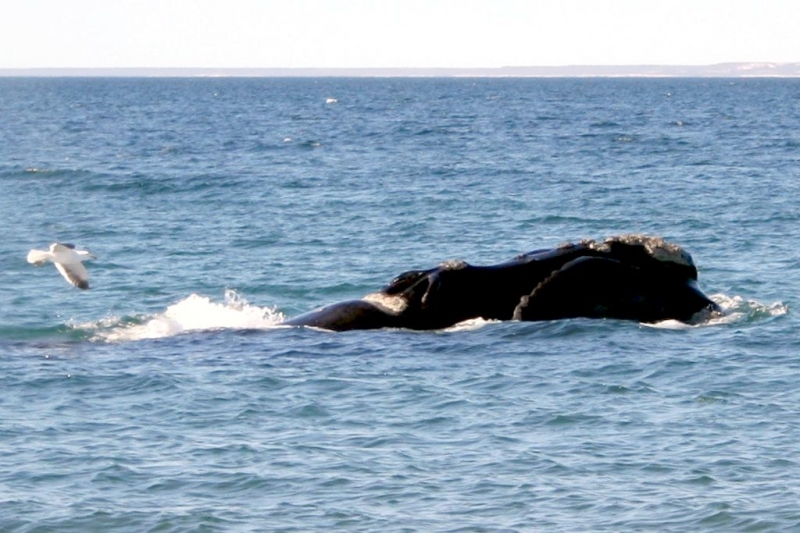 Southern Right Whales, so named because they were historically considered the “right” whale to catch because they are slow-moving and are usually near the surface, reach reproductive maturity at approximately 10 years of age. 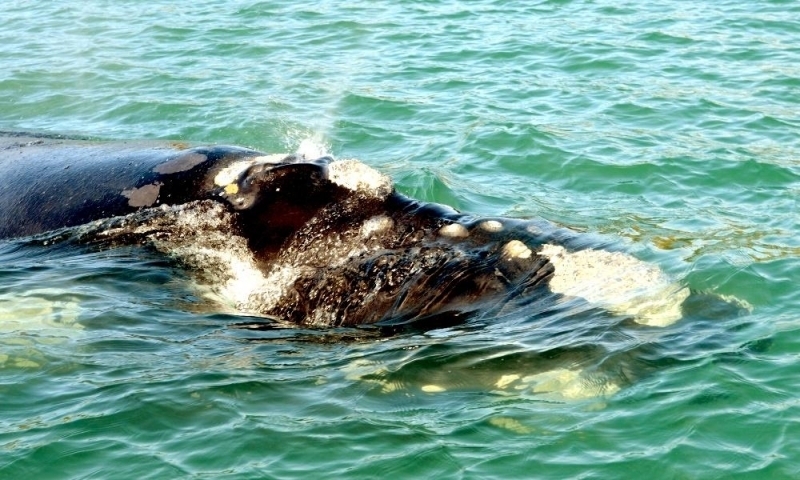 The gestation period ordinarily lasts for 1 year and lactation continues for 4-6 months. 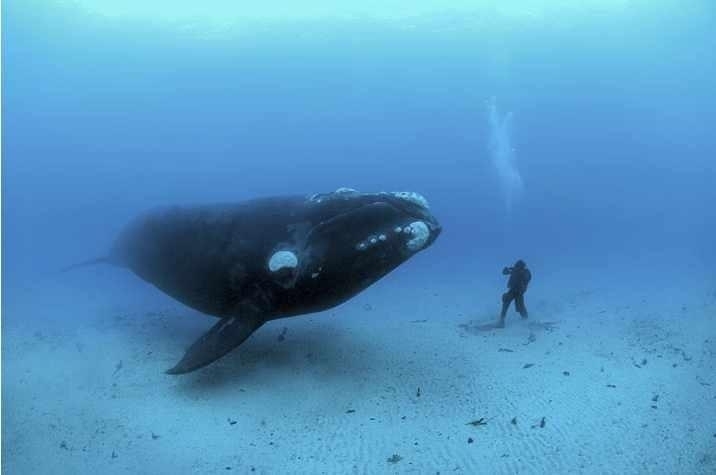 Calves, which are born weighing 1,000-1,500 kilograms and are 5-6 meters long, grow at a rate of 3 centimeters per day. 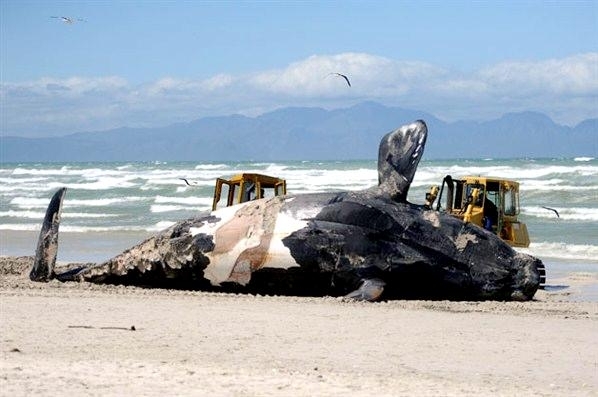 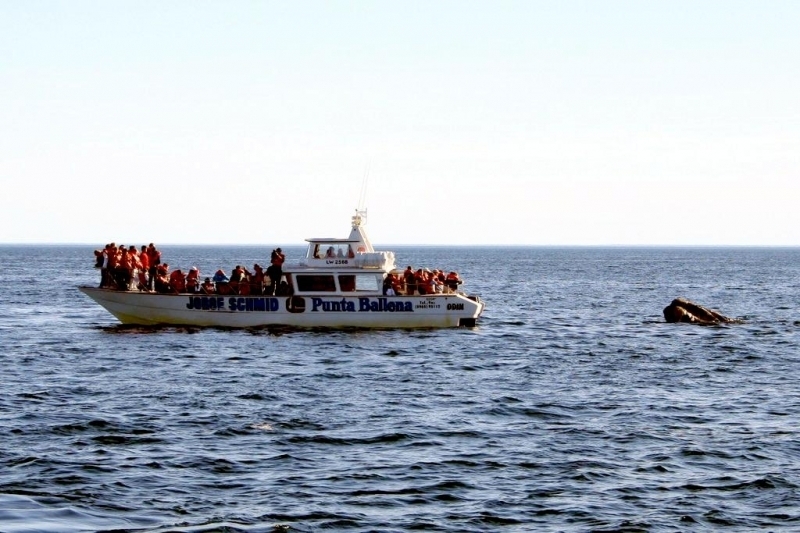 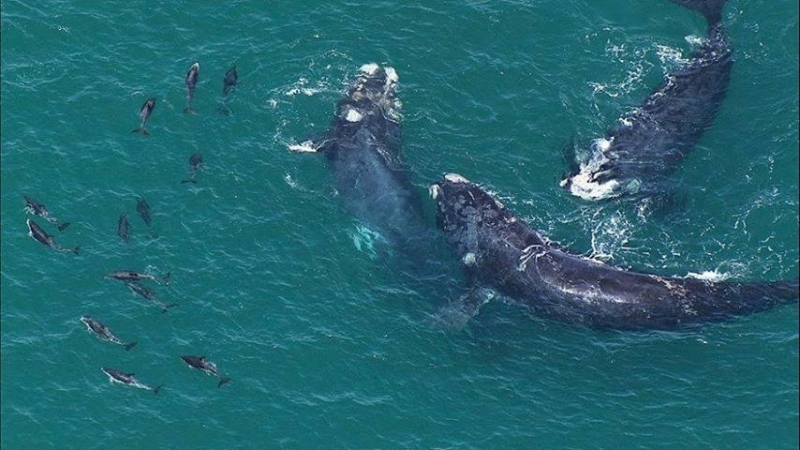 Southern Right Whales mate and calve between 20-30 °S and mostly in protected bays during the months of June-November. 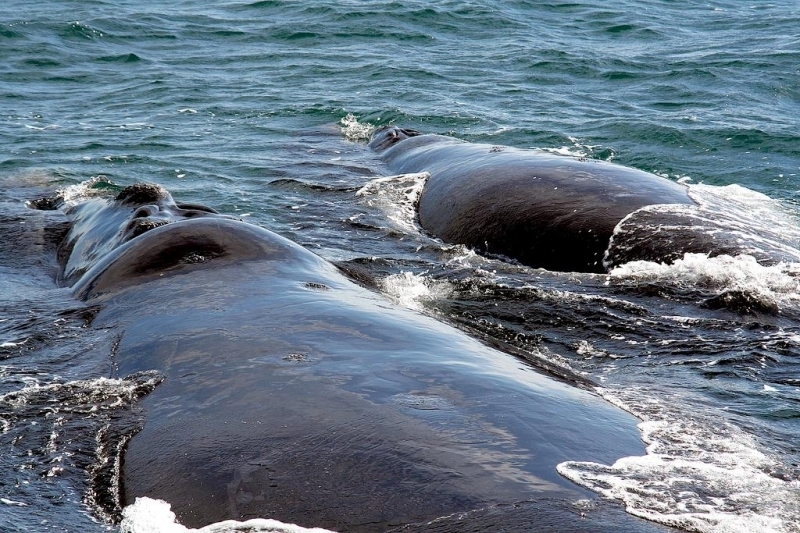 They are polygamous, having up to 7 males per 1 female. 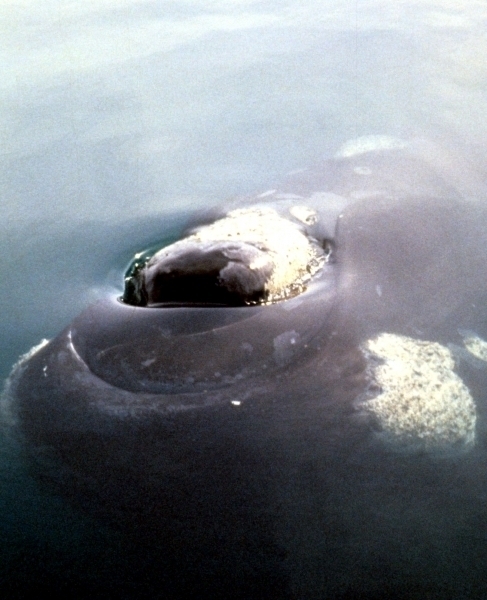 Courtship and copulation is described as being tender and graceful. 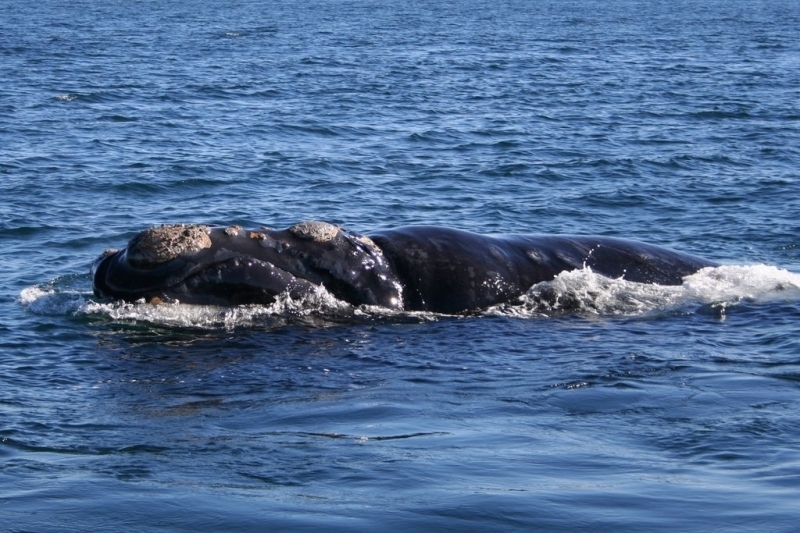 The duration of courting varies, but usually lasts between 1-2 hours, after which the males & females separate from one another. 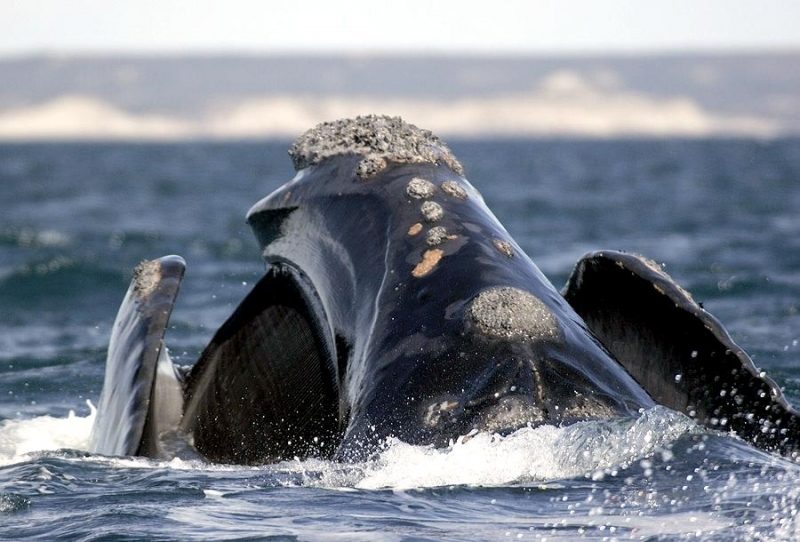 There seems to be no animosity between males mating with the same female, which is unusual for mammals. 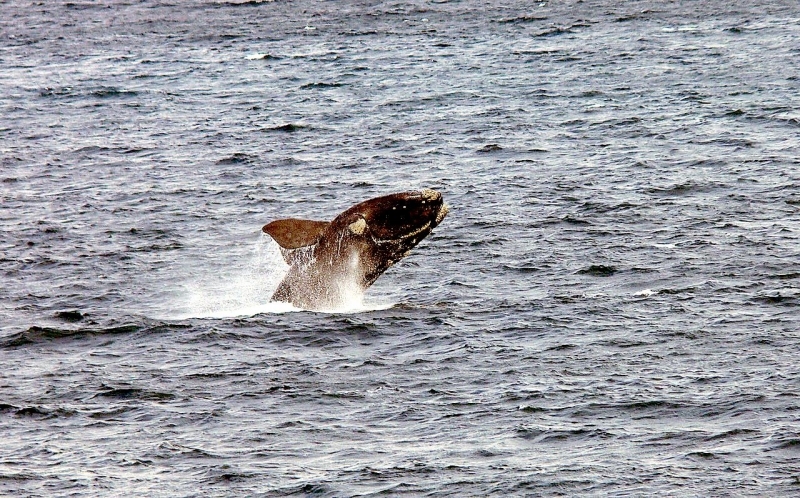 It is believed that this passive behavior implies intra-uterine sperm competition.